This recipe is super tasty! I found this great find on Pinterest which lead me to the website thewholesomedish.com. I used ground turkey instead of chicken. I also used a cup of my homemade marinara sauce. I used Guy Fieri’s recipe Fieri’s Marinara Sauce. You could also use Quick Marinara Sauce or Marinara Sauce , both recipes are from Giada De Laurentis. 1. Preheat oven to 400 degrees F. Spray a 9×13 inch baking dish with cooking spray. 2. Place a large non-stick skillet over medium-high heat. Add the chicken and break it apart with a spoon. Add the salt and pepper. Cook for 8 to 10 minutes, until chicken is cooked through. Stir occasionally and break down down the chicken into small chunks. 3. Reduce the heat to low. Add the garlic to the chicken. Cook 1 minute stirring often. Add the pasta sauce. Cook 3 minutes, stirring occasionally. 4. As the chicken cooks, cut the zucchini in half, lengthwise. Use a spoon to scoop the seeds and centre out of each zucchini half, leaving a 1/4-inch thick zucchini boat. 5. Place the zucchini in the baking dish cut-side up. 6. Spoon the chicken mixture into the zucchini boats. Press the mixture down into the zucchini using the back of a spoon. 7. Sprinkle the zucchini evenly with the Parmesan, then the mozzarella cheese. 8. Cover the baking dish with foil. Bake for 35 minutes. 9. Sprinkle with fresh basil and serve. This burger is awesome! This recipe is taken from one of my favorite cookbooks “The Complete Light Kitchen” by Rose Reisman. I used ground turkey instead of chicken on my first try of this recipe and it was fabulous! 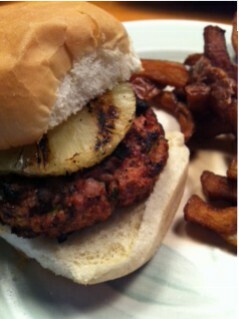 I served my burgers with the extra teriyaki sauce and grilled pineapples. Since we were at the cottage when I made this burger, we decided to also serve french fries from the local chip truck Rolly’s Homemade Fries. 1. To make the teriyaki sauce, whisk the sugar, soy sauce, water, vinegar, oil, cornstarch, garlic and ginger in a small skillet. Simmer for 3 minutes or just until thickened. 2. Place 3 Tbsp of the teriyaki sauce in a bowl and add the chicken, egg, breadcrumbs and green onion. Mix well. Form into 5 patties. 3. Spray a grill or non-stick skillet with cooking oil and heat to high. Cook the patties for about 6 minutes per side or until no longer pink in the centre. 4. Serve with the remaining sauce and garnish with sesame seeds and cilantro. 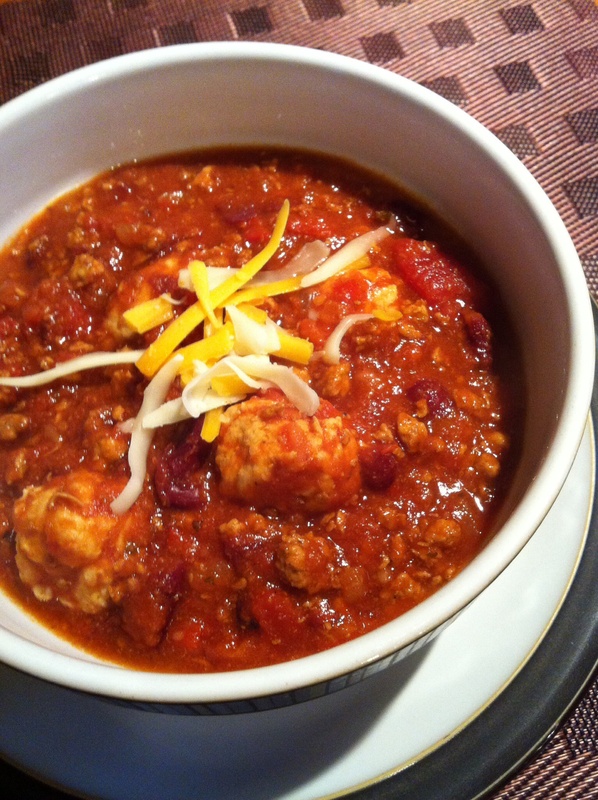 I just found my family’s favourite chili recipe!! I took this recipe from Cook’s Illustrated “The Best Light Recipe”. My kids really liked the little turkey balls hidden inside the chili. 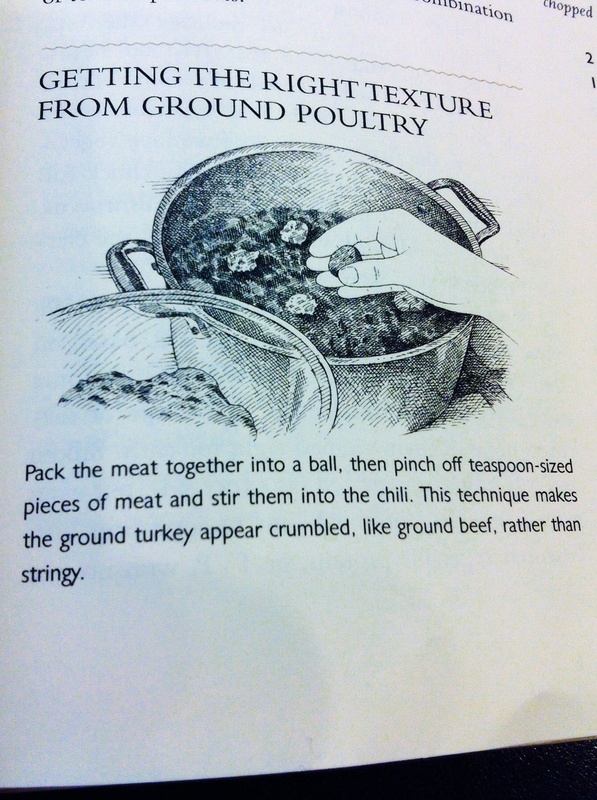 If you can’t find ground turkey, you can substitute with ground chicken. Garnishes, such as diced tomato, diced avocado, sliced scallions, shredded low-fat cheddar cheese, low-fat sour cream, and chopped cilantro, are a nice addition. 1. Combine the onions, bell pepper, garlic, chili powder, cumin, coriander, pepper flakes, oregano, cayenne, oil, and 1/2 teaspoon salt in a large Dutch oven. Cover and cook over medium-low heat, stirring often, until the vegetables are softened, 8 to 10 minutes. 2. Add half the turkey and increase the heat to medium-high; cook, breaking up the meat with a wooden spoon, until no longer pink and just beginning to brown, about 4 minutes. Stir in the beans, diced tomatoes with their juices, crushed tomatoes, broth, and 1 teaspoon salt. Bring to a boil over medium-high heat; reduce the heat to medium-low and simmer, uncovered, until the chili has begun to thicken, about 1 hour. This stuffing is the only one I make with my turkey dinner. It is taken from Homemakers magazine. I had to call my mother to find out what year and she thinks about 1996/97. I used to stuff the turkey but for the past couple of years I just cook it after the bird comes out. 1. In a skillet over medium heat, melt butter, add onion and celery. Cook until softened, about 5 minutes. Stir in garlic, squeezed from roasted cloves. In large bowl combine crumbs, apples, parsley, sage, thyme and onion mixture. Add enough liquid to moisten the crumbs. Salt and pepper to taste. NOTE: This recipe makes enough for a 10-12 lb bird. It can also be halved for a 4-6 pound bird. 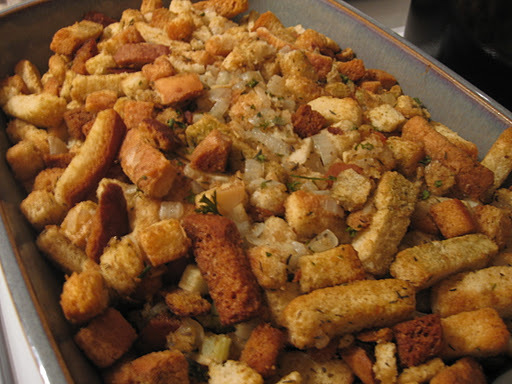 The stuffing can be baked separately in a covered casserole at 350F for 30 minutes. ROASTED GARLIC: Slice 1/2 inch off top of each garlic to expose clove. Remove outer leayers of papery skin. Lay in foil and drizzle with oil. Cover up tightly. Bake for 350F for 30 to 45 minutes.